With spring cleaning on our minds and always looking for ways to freshen up our home, these completely natural DIY air fresheners are such a great way to make any space smell welcoming and seasonally fresh. Not only do they smell amazing, they're so simple to make using ingredients you may already have around the house and they work double duty as decorative accents. They're so effective in fact, you may never buy another artificial air freshener again. The bright citrus paired with classically calming lavender and juniper make for a freshening and inviting scent, perfect to fill your entire space. It's a great one to simmer on the stove or place in jars right at the entryway. The bursting aroma of cool peppermint combined with the citrus and more subtle cucumber fragrance gives off a clean and fresh scent — perfect for areas like a hallway or guest bathroom. To create a lasting aroma for filling your entire space, combine ingredients in saucepan or large pot over the stovetop. Fill with enough water to cover the ingredients, about ½ to ¾ of the pot. 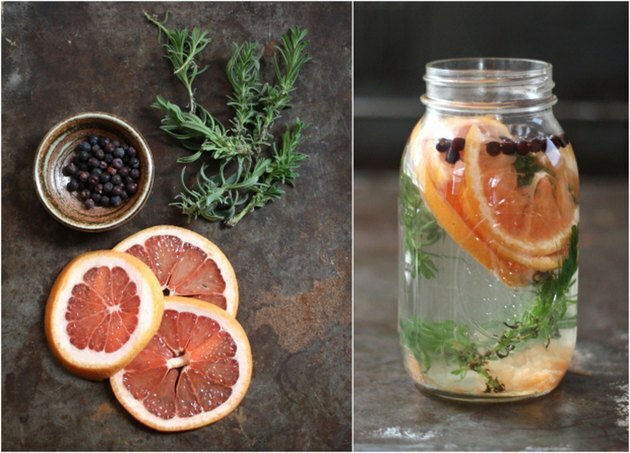 Bring water to a boil, then turn down to a low simmer, keeping on the back burner and allowing the most wonderful fragrant smells to wander through your home. In order to keep the scent flowing for long periods of time, keep an eye on the pot, adding more water and an extra slice of fruit or two every so often as the water lowers. 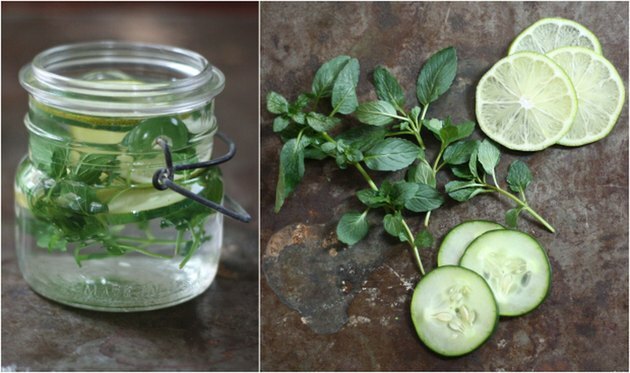 To make portable scents for individual rooms, put on a teapot to boil and stuff the natural ingredient combinations into glass jars. Fill the loaded jars with boiling water, watching in delight as the different elements float to the top and others sink to the bottom. 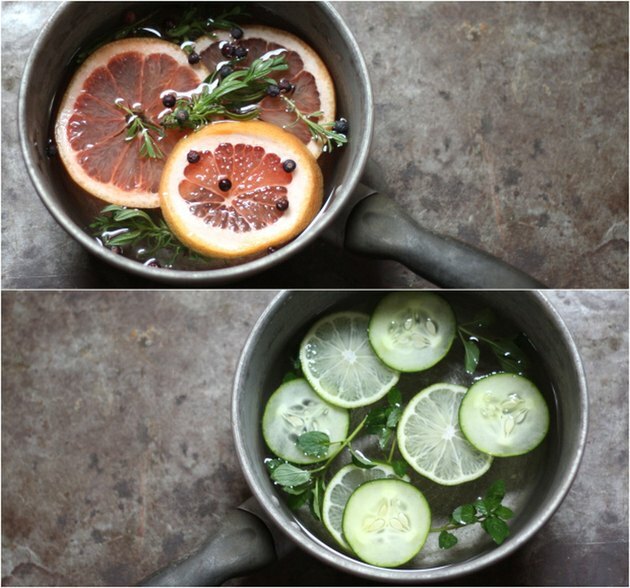 Hot water is key for these more portable scents, as it helps bring out the essence of the ingredients, making everything around smell so fresh and fragrant. Just be careful when handling the jars and their placement, as the glass will be very hot. Place jars as decorative updates around key areas of the house where you'd like a welcoming aroma, like an entryway, bathroom or gathering space. If entertaining, you could even group them together on the table as a centerpiece, allowing guests to take them home as parting favors. 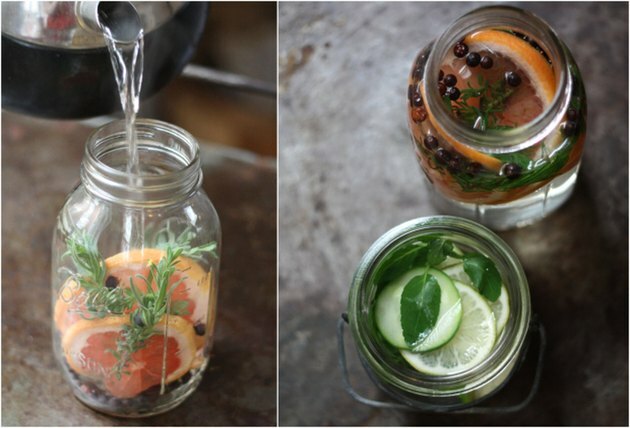 If you're attending a spring gathering, these pre-stuffed portable jars also make a great hostess or housewarming gift. Just twist off the lid and heat upon arrival to share and enjoy. 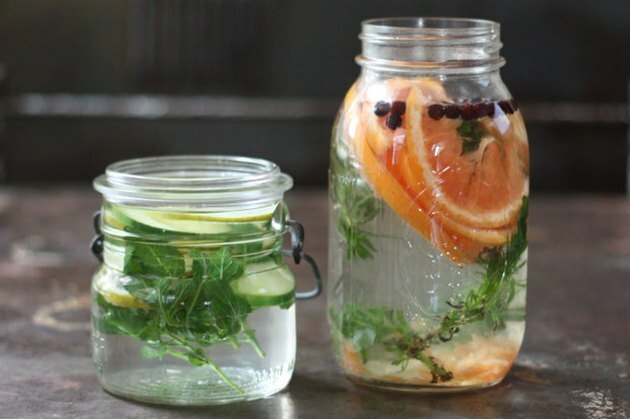 To keep the jars emitting a strong scent, replenish the cooling water every so often or try resting it over a mug warmer or even a small fondue pot with tea light underneath. You could even place everything in a mini crock pot, keeping the mixture warm and aromatic in the room of your choice.